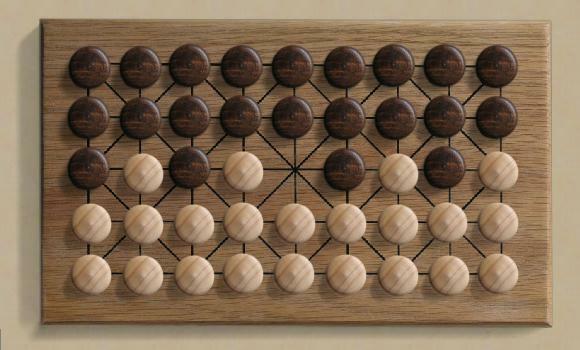 The object of the game is to win by capturing all of your opponents pieces. Draws by repetition are possible. Arrange the 22 pieces for each player as shown. Moving: White moves first. Pieces are moved by sliding one space along one of the the lines. Note that some points lie on diagonal lines, while others have only horizontal and vertical directions. Capturing: you can capture a line of your opponent's pieces by approach by moving toward them into the adjacent space, or by withdrawal by starting in the adjacent space and moving directly away from your opponent's piece. In some positions, you could capture either way, and you must choose one or the other. In the opening, many captures are possible and so a lot of pieces will be eliminated very quickly. The basic tactics are to squeeze your opponet's pieces so he is forced by zugzwang to move toward you, or to set up sacrifices where a mandatory capture is ultimately disadvantageous.